In 1994, on a visit back to his alma mater, Sinofsky was stuck at Cornell during a snowstorm. While he was there, he saw how Cornell was taking advantage of the Internet with email for undergraduates and online course listings. He dashed off an email to Gates with the subject line “Cornell is WIRED!” emphasizing how important the Internet was becoming. Sinofsky’s email kicked off a chain of events that eventually led Bill Gates to write his famous “Internet Tidal Wave” memo in 1995. That memo caused every Microsoft product group to start building Internet connections into their products and paved the way for Internet Explorer to be bundled into Windows, kicking off the consumer Internet revolution. The reason this excerpt is of particular interest to me is that I was actually at Cornell University during that amazing era, 1989 to 1994. I was just starting my IT career in 1993, and wasn't in on Sinofsky's visit in early 1994, on the other side of campus. Yes, I didn't even hear about the visit. I was a worker bee, busy working in the Cornell Information Technologies department, helping get students online using Cornell's unique in house "Bear Access" for POP email, course catalogs, Usenet newsgroups, and anything that else that ran over TCP/IP. We were pioneers, using Sportster modems for off-campus access, and mostly 10Base-T on campus. My focus was DOS and Windows users. So I guess you could say I helped smooth the rapid build out and adoption of networked DOS and Windows based PCs. Helping Cornell get "WIRED", as Sinofsky described it. An admittedly small role, but certainly a fun way to start a career in IT. I had a fat pipe to the Internet myself at work, and remember the moment well, when a colleague a few feet away stumbled upon Mosaic, the first web browser, with a graphical interface. We knew that was the way to go. It was an amazing era, being at the forefront of something we knew was big. Those were the wild west days of the early Internet. Kind of got that same feeling again, watching those wonderful scenes in "The Social Network." Turns out Cornell's important role in computing history was intertwined with Apple/NeXT as well. Steve Jobs visited the spectacularly beautiful Ithaca NY campus in February 1989, and I moved to Ithaca in August of that same year. So it was in August of 1994 that I returned back to settle down in my hometown in central Connecticut, to a new job training corporate resellers on the merits of OS/2 and networking. I look back on that era now, realizing how fortunate I was, and finding new joy in recounting these tales. And now, back to the future, which I've always been quite fond of. 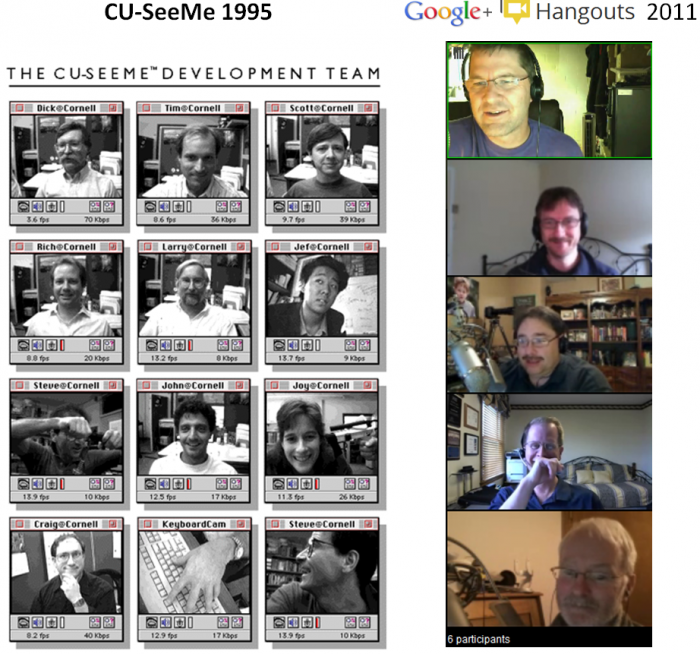 Mar 09 2013 Update: Cool little bit of reminiscing by Robert Scoble and Leo Laporte at this spot on This Week In Tech 404, where they actually talk about CUSeeMe for a bit!